Practically all court and official business was suspended Wednesday afternoon in Muskogee in honor of the memory of Judge John R. Thomas, who was murdered by mutinous convicts during an outbreak at the state prison at McAlester on Monday. The United States district court, successor to the body over which Judge Thomas presided from 1897 to 1901 adjourned at noon, and the other courts adjourned either before or at the funeral hour, 2 p.m. The funeral was held from the residence where services, beautiful because of their simplicity, were conducted. Long before the hour set for the funeral hundreds of friends of the departed jurist, with downcast eyes and saddened faces, gathered at the home at 1419 West Okmulgee which Judge Thomas loved so well in life, and where he had lived since his coming to Muskogee in 1897. Heaps of floral offerings, indicative of overflowing hearts, paid tribute to the memory of John R. Thomas, the friend of hundreds of Muskogeeans for nearly two decades. The impressive episcopal church service was read by Rev. H. J. Llwyd, rector of Grace Episcopal church, and in a short talk Rev. LLwyd spoke of the life of Judge Thomas and of the loss his friends would feel after his untimely death. Following the service at the house, the Masonic lodge took charge of the funeral. 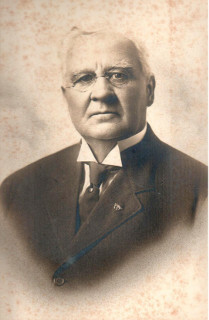 The Masonic burial service was to be read at the grave, and members of the lodge, which Judge Thomas formerly served as grand master for Illinois and of which he was a devoted member, formed a body guard of honor to the cemetery. The active pall-bearers, members of the Masonic order, were J.P. Farnsworth, George N. Wise, Earl Bohanon, F. P. Schaffer, Charles L. Yancey, N.F. Hancock, Ed Griswell and W.H. Clark. Rev. J. K. Thompson was designated as chaplain to conduct the service at the grave. The honorary pallbearers were Judge Ralph e. Campbell, Judge Farrar L. McCain, Judge R.P. deGraffenried, Judge Z.T. Walrond, Judge William M. Harrison, Judge William R. Lawrence, Judge John H. King and DeRoos Bailey. The only surviving relative of Judge Thomas in Muskogee for the funeral was Mrs. Carolyn Thomas Foreman, his daughter. His son, Captain John R. Thomas, U. S. A. is at present stationed in Honolulu.